L, his entire immediate family, and 99% (slight exaggeration) of his extended family went to the University of Michigan. For the past nine years, it's been a source of amusement for me to watch the C family devote their lives to the U of M sports. I'm not just talking about a few Saturday afternoon games-- L's parents went to Hawaii this Thanksgiving just to watch the Wolverines play basketball. Apparently, the beaches and perfect weather were just an ancillary benefit. It's not that I don't appreciate this devotion to one's alma mater, it's just that I don't understand it. I chose my college(s) based on lots of things, but the ability to sell out a football stadium was not one of them. Did the Hornets have a football team? A woman in her thirties should know that, I guess. What I do remember about college mostly revolves around Woodlake, Stingers, and polar bears. 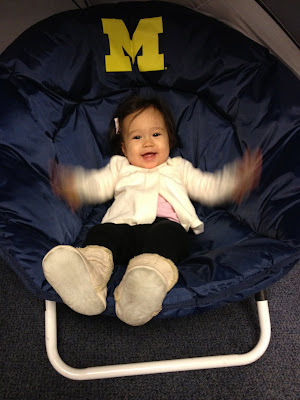 When we went to Ann Arbor over the holiday for L's cousin's wedding, I had myself an educational experience. 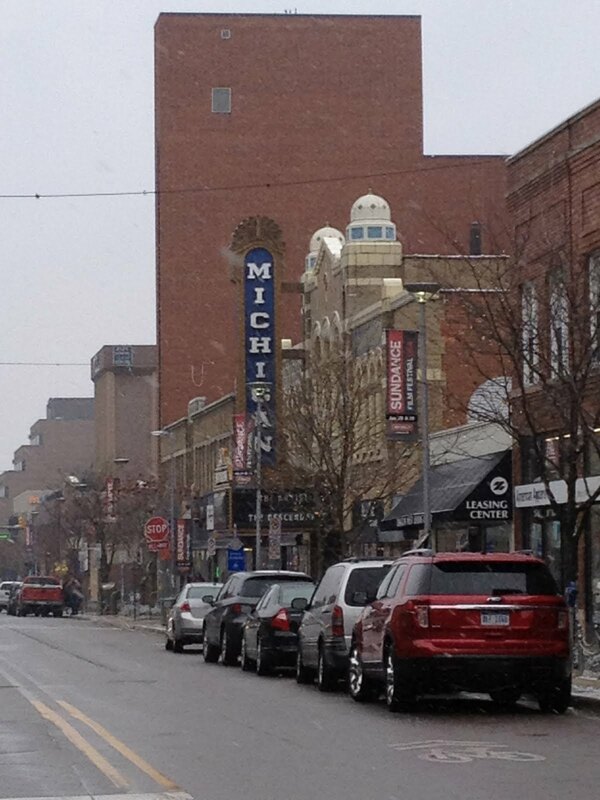 Ann Arbor is a true college town-- much like Chico without the hillbillies (sorry). The school colors are MAIZE and blue, not yellow and blue. And this theater is where L's parents went on their first date, to see Alfred Hitchock's "The Birds". Romantic? Mais oui. It's hard for me to walk down the street of a college town and not wish I'd done some things differently in my own college days. 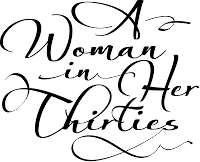 A woman in her thirties can fall into that trap a lot-- the 'what if' rabbit hole. But then it occurred to me that all my choices, some good and some really, really stoopid, led me here, to this moment. Where I am truly happy. So the most important thing I came to understand is that while I might have my own ideas about where I want my baby to go to college (Stanford. Full ride. ), and L's family might have theirs, at the end of the day, it will be up to Anna to make the experience what she wants it to be. But a little maize and blue can't hurt. Wow! What a trip down memory lane! I went to the "gold and midnight blue" neighbour just south of the border (The University of Toledo). 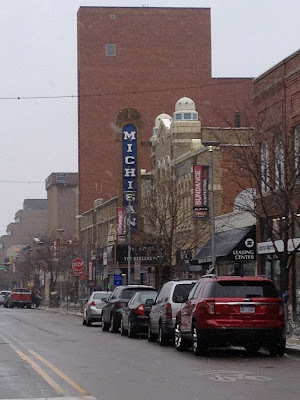 We went up to Ann Arbor frequently for a little taste of fun next to the Big House (Red Hawk Bar and Grill was a favorite place to hangout). I can relate to the questioning of your college choice and wondering if you missed out on something more somewhere else. I tried out two universities near home before I ended up at Toledo. I can tell you these thoughts you're having are just part of "the grass is always greener on the other side" syndrome. After a couple of visits to Toledo, I spent a whole year anticipating marriage and moving up to go to this amazing school with all these cool activities and a beautiful campus. The reality? Meh. I should have stayed where I was... the academics (and price!) were much better. So yes, hang on to the knowledge that the path you chose got you where you are and it's the best place in the world to be!! 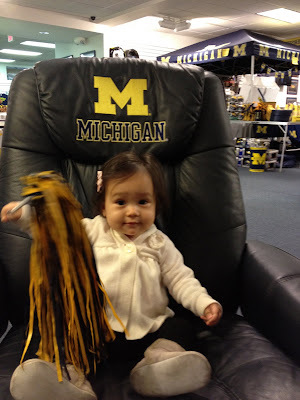 When Mrs C told me that Optimista had chosen to go to Michigan, I said you must have put in the good word. She said, "On the contrary, We said we would give her a new car if she would go to the in-state Big Ten school." I told her, When L graduates, I think he will take the car and go to Minnesota. I was wrong; he went to Michigan too. If you think I made this up, ask Mrs C.
N and I got football season tickets for a number of years after graduation even though we lived 40 miles away. Our company sent several of us to see a technical consultant at the University. Afterward, I went to Ulrich's book store to look around and ended up buying a sweatshirt, a recording of the marching band, and another of the glee club. I am part of the 99percent that L.Shanna mentioned. One of the best weeks of my college life was when you and Kim visited me in Mass. I know the feeling. I married into a Notre Dame family. In fact, my in-laws were married, and will be buried, at Notre Dame. And while we didn't win in the Big House this year...there is always next year. Go Irish! My friends said my blood is blue in color. I'm proud of it.